Hey guys a nice update on specific device bandwidth usage and thanks to the team for bringing us a step closer towards QoS with the 1.5.1 app update. This will definitely be useful and from a new feature request would love to see either via the app or a web portal the ability to cap total usage or bandwidth. My idea would be to either completely stop the device or once threashold is hit then downgrade service. Additionally have the ability for notifications either via push back through the app or email alerts with reporting. What do you think? Anyone else interested in something like this? I'm assuming this is only on normal eero mode where it's acting as the gateway device? My setup is bridge mode due to the fact I need certain static route and ddns features. All my devices are showing as idle when I know this not to be the case. Does it take time to update within the app? Edit - 2 hours later and now it's working! I still only show Idle and I have 3 streaming sources running at this time. App installed about 3 1/2 hours ago now. I'm not running in bridge mode.. I'm happy to hear the issue resolved itself for you, lgreenberg . As for your question, Dixit — this feature is not available in bridge mode. I'm happy to share the feedback with our team. Thanks for reaching out and sorry to hear your devices are showing as idle. We should definitely take a look. If you haven't yet, feel free to give us a call at 1-877-659-2347 or email us at support@eero.com. We'll be happy to take a look. Also, note that this feature only measures bandwidth over WAN. For example, if you have media content on a local network device, these numbers won't be reported in the app. Thanks! I logged a ticket with support. My app also shows "Idle" for the vast majority of my devices; a couple of them do show activity. This is clearly wrong in my case because three of my devices are nestcams which are continuously streaming videos (and I've checked that there is motion in the videos :-)). I'm not in bridge mode. diwan I have 10 Nest Cams and they all show idle. Same situation as you. jkingsle did anyone find a solution? I have several nest cams that eero reports as idle. Because these devices upload HD audio/video 24/7, there should be upload activity. I tested an Apple TV and I do see download activity when steaming movies. Maybe the problem is specific to nest cams? 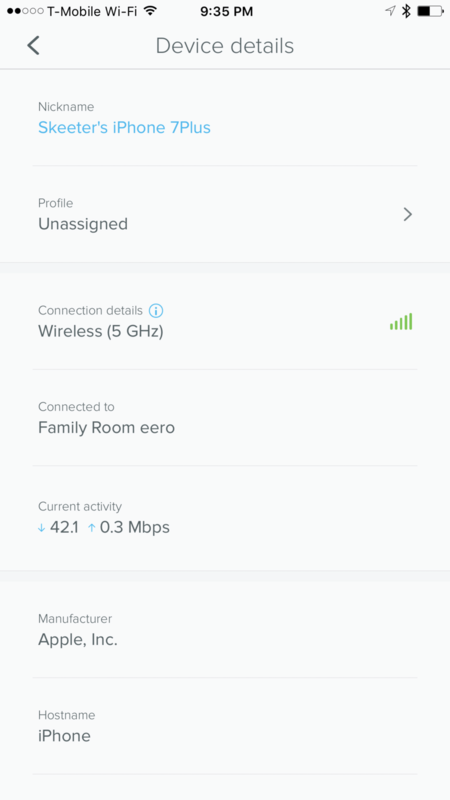 Ssunbrn I have 4 Nest cameras and they all show active traffic in the eero app on my network. Have you tried contacting eero support? cMoo92 thanks for the response! I have 5 nest cams that are actively uploading video/audio to the cloud 24/7. The app shows 4 cams as idle and only .4 kbps upload on the doorbell cam. I called tech support and they verified seeing the same. They could not identify the cause or recommend a solution. I was told they would submit a “feature request” on my behalf that would hopefully get attention from the engineers. If you haven't yet, please contact support. We'd be happy to take a look into what is going on. You can open a ticket by sending an email to support@eero.com . Sorry for any confusion, diwan . That actually isn't the case -- data usage isn't considered to be under reported. We are of course looking into reported issues. I think what they meant to say is that it's potentially not showing any usage because the cams are using lower bandwidth numbers so they are considered as idle. Our team will continue to look into what you have reported. Are your other devices showing activity when in use? I should clarify that even when a device is online and connected, it may not be actively using bandwidth. Also, some services, such as content streaming, may appear idle at times as content isn't being downloaded the entire time. Instead, these come in waves, and you will see the usage numbers fluctuate as content is downloaded. I've opened the eero app on my phone and watched the bandwidth usage of one of my my nest cam while I was actively waving my hand in front of it. The eero app showed it as idle. On observing the bandwidth on the app while doing a speed test on my computer, it seems that the data that the app shows is an average over a very short recent window. It would be good if one could see some history which would actually help in debugging network issues. Ideally I'd like to see a bandwidth usage graph over the last hour (at least). I'll relay that back to the team as they look into the reported issue. Jeff C. did you ever get anything back from the engineering team regarding whether there was an issue with the eero app reporting network activity for nest cameras? Thanks! I agree, this feature should be available in bridge mode as well. Historical information for each device would also be extremely helpful. Can anyone else provide any insight into whether the eero app is showing network activity on their nest cams? Ssunbrn Yes. For ex. the eero app shows that my Nest cam outdoor network activity is 12k down, 527k up. SOLVED. I was able to get eero to correctly report network activity by assigning static ip addresses for each camera in the advanced section of the eero app. Be sure to assign an ip address that is not in use and then power cycle the camera. Ssunbrn I've got IP reservations for my outdoor Nest cams, as suggested by eero support after many disconnects. I've always had network activity showing for the cams tho, so not sure why it made a difference for you. Whatever works, I suppose.